The 27-year-old actress was spotted in Beverly Hills on Monday while heading to a nail salon. Emmy Rossum carried a copy of Naked by the Window: The Fatal Marriage of Carl Andre and Ana Mendieta, a book by investigative author Robert Katz on the death of the beautiful 36-year-old sculptor Ana Mendieta (available at Amazon). If you’re following the American television comedy-drama Shameless, which stars Emmy Rossum in one of the lead roles, please note that the fourth season finale will air on Sunday (April 6) on Showtime. 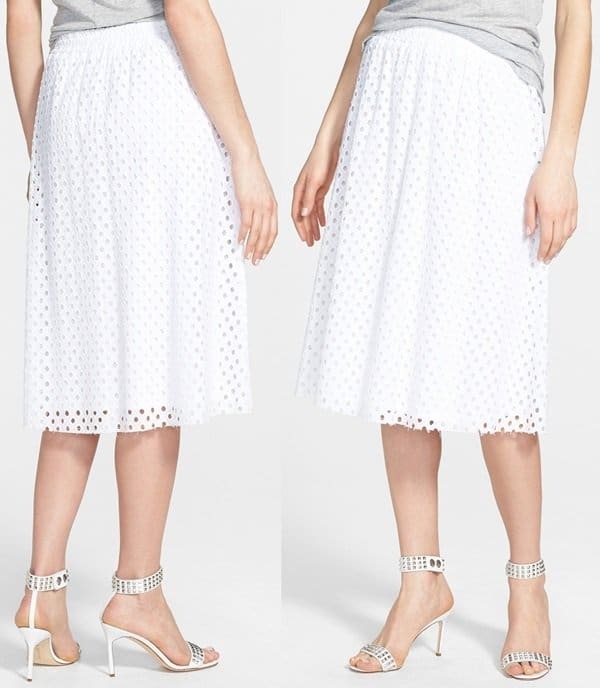 The successful actress sported a pleat eyelet Tessa skirt by Ella Moss (available at Nordstrom) paired with a lightweight grey blouse and a pair of ankle strap Cambelle sandals by Yosi Samra (available at Nordstrom). Emmy completed the casual outfit with a plaid blue and white bag.